Astronomer David Trilling has a pragmatic perspective on the importance of his research. “If an asteroid’s going to hit the Earth, you want to know how big it is,” he said. The Northern Arizona University professor of physics and astronomy measures asteroids that get close to Earth—close being roughly the moon’s distance away, more or less a few hundred thousand miles. However, one can’t simply look at the space rock and estimating its size, though. To effectively measure the size of an asteroid, an astronomer uses an infrared camera to measure the amount of heat it emits: the bigger the asteroid, the more heat it gives off. Usually that technology is not cheap. It’s a large box filled with liquid nitrogen or helium that weighs so much scientists must invest in larger, heavier telescopes to accommodate the camera. The result has been fewer scientists using the technology at all. To combat that, Trilling decided to get TIPSI. After conversing with colleagues, he recruited seven NAU students to build the Thermal Infrared Planetary Science Imager (TIPSI), an infrared camera that weighs 70 grams, operates at room temperature and can be connected to a regular computer through a USB drive. It cost about $15,000 to make and regular maintenance is limited to needing a power source and access to the Internet. At this price point, this infrared camera is 20-50 times cheaper than the old type of infrared camera. 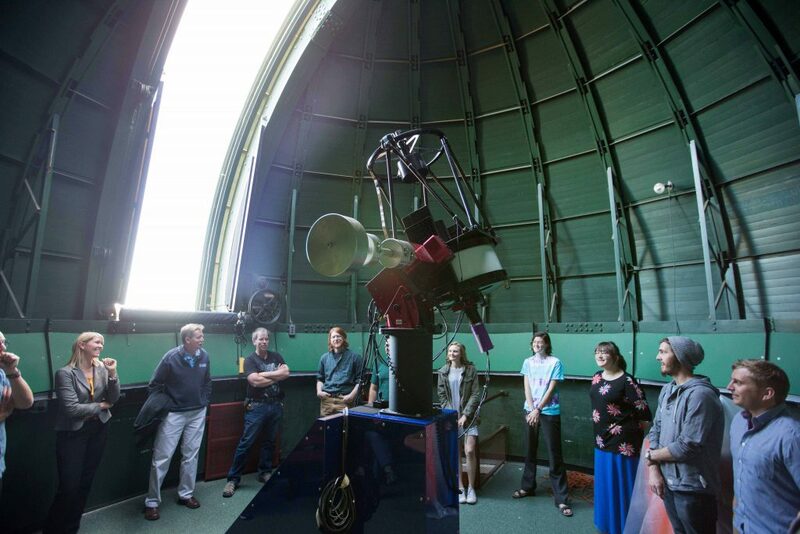 The project, which was unveiled at the Barry Lutz Telescope at NAU on May 2, started with a hallway conversation between astronomy professor Christopher Edwards and Michael Mommert, a physics and astronomy research associate. Although they advised the process, the students built the system, which included creating the computer program to collect and store data, finding a way to mount the camera on a telescope and figuring out how to get power and Internet to the camera. The students are Bradley Moldermaker, Dan Avner, Daniel Krollman, Nathan Smith, Cheyenne Clutter, Corrie Vanlaanen and Zowie Haugaard. They came from physics and astronomy, computer science and mechanical engineering and include two graduate students and five undergraduates. 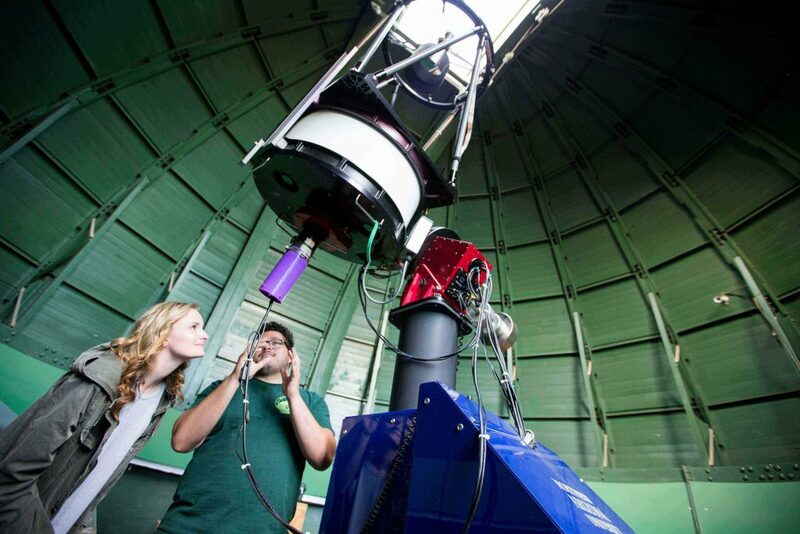 Smith, a master’s student in applied physics, brought a critical expertise to the project—familiarity with the telescope and knowing what astronomers needed from an instrument like TIPSI. He helped with the design of the mounting hardware, helped debug the camera control software, developed and tested different ways to analyze the data and has been the guinea pig at the telescope making observations. Members of the team who built TIPSI celebrate at the unveiling of the infrared camera at the Barry Lutz Telescope on May 2, 2017. In addition to the real-world project management experience the students gained, the creation of TIPSI provides two significant benefits, Trilling said. One is this disruptive technology will allow more people to track and measure the size of asteroids that fly near the Earth, of which about five are discovered every night. It allows astronomers to learn more about the behaviors of these rocks in case astronomers discover a big one headed for Earth. The other is this technology can now be accessible. The uniqueness of TIPSI isn’t what it does, it’s that it does it at a fraction of the cost of its fancier counterpart, making these kinds of measurements accessible to professional and student-level observatories for the first time. The team plans to submit a paper for publication this summer that will include a shopping list and instructions for astronomers to make their own TIPSI telescopes. TIPSI was made possible through the donations of NAU alumni Robert Mueller (1980 BS geology) and Jim Skelding (1993 BS physics).